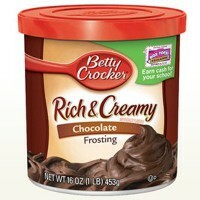 No true American cake is complete without its trademark frosting, and Betty Crocker does it best! 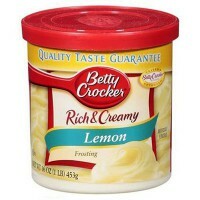 Her Rich & Creamy Lemon icing with its zesty lemony taste is just the thing for your baking creations. Easy to spread and even easier to lick off the spoon, one pot of Betty Crocker lemon icing will frost 24-32 cupcakes or one 8 X 12 cake. 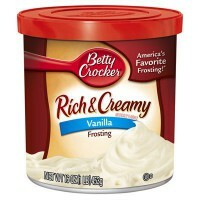 After opening, Betty Crocker icing will keep up to 30 days in the fridge. But chances are it won't last the 30 days. Cover and store in a cool place for up to several weeks. 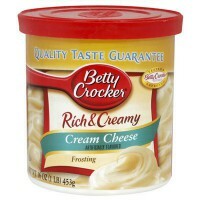 Stir at room temperature before use. Do not heat. Nutrition facts (for 100g): calories 424Kcal, total fat 15.2g (saturated fat 7.6g), total carbohydrate 69.7g (sugar 57.6g), protein 0g, salt 0.5g. 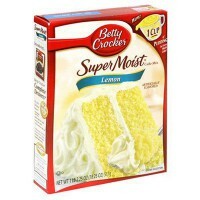 Un peu sucré mais parfait pour les cupcakes. Con este producto, nunca fallas, tiene un sabor estupendo y suave, con el que todo el mundo disfruta.